Jeffrey Samuels is a Ngemba painter, illustrator, designer, mixed media artist and printmaker. 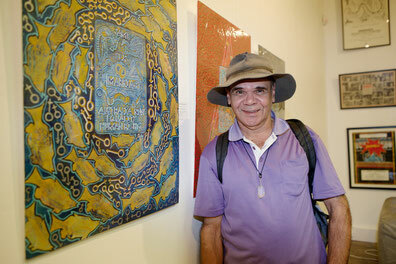 Jeffrey is a founding member of Boomalli Aboriginal Artists Co-operative. In his art practice, Jeffrey has always sought to affirm his “Aboriginal identity and cultural heritage and its artistic expressions” and his dedication to community well-being. In 1984 Jeffrey participated in Koori Art ’84 at Artspace, Sydney, one of the seminal exhibitions that marked the emergence of the urban Aboriginal artists’ movement in Australia. He has participated in a number of Boomalli exhibitions over the years including Boomalli Breaking Boundaries (1989), Blackroots: Koori Indigenous Gay and Lesbian Art (1997), and the solo exhibition Stylin-Up (2000). In 2000 Jeffrey was commissioned to recreate a painting for the Nature Segment of the Opening Ceremony of the Sydney Olympic Games. His work is held in the collection of the National Gallery of Australia, the Art Gallery of New South Wales, Flinders University, the Australian Museum, City of Sydney, Andrew Forrest private collection and the National Museum of Australia. Jeffrey travelled to China in 2007-2008 and was one of the Artist members of Boomalli who was invited to be a part of the Australian delegation at the Guangdu International Art Fair. Jeffrey facilitated workshops and created a Reconciliation Artwork in 2016, as part of St Vincent's Hospital Reconciliation Art Project. Most recently, Jeffrey's work "Gadigal Acknowledgement Respect" was featured on the cover of the International Convention Centre's Reconciliation Action Plan. A detail of the artwork can be seen on the entrance doors to the Convention Centre at Darling Harbour, Sydney.